First of all lets establish the necessary assumptions needed to understand the concept of what a strategy is. A strategy is a tool for how an enterprise (business, public institution, government institution or other form of organization) uses a strategy to realize the goals that the executive team of the enterprise has articulated. There various ways of seeing how the enterprise and its strategy should be handled and how they interact. Mintzberg (Minztberg et al 2009) has identified 10 different schools of planning. The Breakout Strategy can be identified as belonging to the school that is defined by Mintzberg as the entrepreneur school. This is based on that the Finkelstein et al. (Finkelstein et al. 2007) works with the assumption that the local leaders in the enterprise have to act as entrepreneurs that identifies, develop and enforce an updated business model. As such Finkelstein et al. emphasizes that they have applied their theories on cases that have both prevailed and failed. As such the authors applies their theories to explain what happened and what didn’t happen. One of the core messages of the book is that the enterprise, its decision makers and the acting employees needs to think as the customers. The concept of systemic thinking is represented by the business model and through the ideas on implementation that Finkelstein et al. (Finkelstein et al. 2007) focuses on that the leader (or leaders) needs to take charge and enable change through their actions (embodiment). Thereto is notable that the business model is build upon six different aspects of the value the enterprise as a whole deliver to its customers. As such the six aspects enforces the enterprise to view on what part it has to build up and what part it can limit in its struggle to achieve better results. According to Finkelstein et al then the business model is build around six different elements that in total defines the feelings of the value and the value the enterprise adds (value added). The six components are price, features, quality, support, availability and reputation. Within each of these six components are there five options within each of the components e.g., for the price component premium, Premium competitive, Competitive, Competitive / Leader and last the Leader. Finkelstein et al. (Finkelstein 2007, p.184) identifies (correctly) that the vision of the future has an impact on how the enterprise’s business model should be like and the executives should as such consider the six components when they are articulating the corporate strategy. 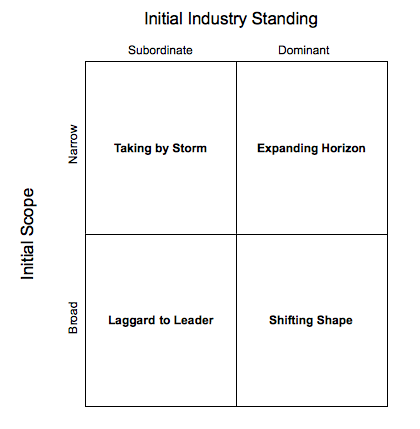 As such the theories presented in the breakout strategy are focused on that the leadership of the enterprise (top management or what is defined as the executive group) has to show that their intentions are and they have to win over the employees. Finkelstein et al. talks about British Airways as a case where the CEO failed to win over the employees and as such he (and the executive team) faced challenges. As the breakout strategy deals with winning over opposing fractions. Finkelstein et al emphasizes that communication of the values, goals and vision for where the business model should develop to have to be communicated to the members of the enterprise. As such the breakout strategy embraces the holistic management approach which is also present in the theories concerning Enterprise Architecture. Finkelstein et al (Finkelstein et al 2009, p- 20) defines four different forms for the breakout strategy to be applied and the breakout strategy have four different conditions. The breakout strategy can be used in a market that is narrow and its beginning (and as such subordinate) to the established market and their industries. Typically the two forms of conditions (taking by storm, expanding horizon) are to be found in the narrow market. In the broad market then the laggard to leader and shifting shape form is to be found. Thereto does Finkelstein et al defines four forms of breakout companies and as such also four forms of breakout strategies. The four different break out forms are organized on emergent markets and established markets. The emergent markets are characterized by that the enterprise that is within them is able to work with a new form of technology, service or market space that is adaptable to the product or service the enterprise sells. The established markets are characterized by that they are mature markets such as there are enterprises that competes on gaining market share. Typically will the industry go into a spiral where the products are seen as commodities and as such commodities are sold primarily based on the price of the product. For the particular markets the forms of breakouts are characterized as the true originals, revolutionaries, the wave raiders and the big improvements. The originals usually shapes and develop a new market e.g., by inventing new superior services e.g., they go from a red ocean to a blue ocean. In the same time the revolutionaries in an established market re-invent their enterprise in a way that makes the enterprise able to compete by differentiating the products or services. 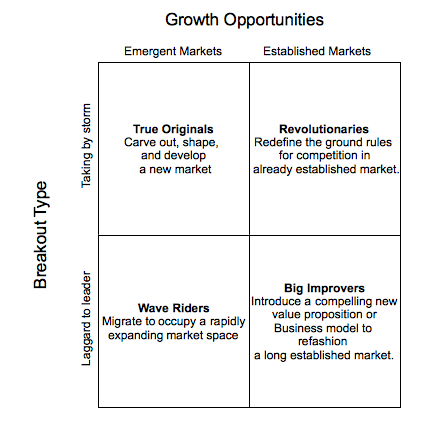 The wave riders work with the assumption that they find market space and the market space over time will expand. The big improvers include enterprises that is able to define a business model and value proposition. Likewise is it able to refashion its business model. An Enterprise Architect and a Coherency Architect can make use of the breakout strategy since it has the approach to systemic thinking. As such it is notable that the approach can be used to either aide the enterprise architect or the coherency architect with explaining how enterprise architecture and integrated governance can aide the enterprise with optimizing its business model and avoid failure in the effort to change. In the same time does Finkelstein et al (Fineklstein et al. 2007) handle the issues of the current state (in Enterprise Architecture known as the to be state) and how the enterprise evolves into a new and better enterprise that is able to achieve the goals of the particular enterprise. The Coherency Architect should be aware of that the business model defines several issues of how the enterprise should adapt to the market and how it operates. The operation model can in some aspect be defined as the operation model or at least there is an overlap. The operation model is discussed by Ross & Weill (Ross & Weill 2004, 2009 & Ross et al 2006) and as such it serves as a map or conceptual idea on how the enterprise operates. Bernard (Bernard 2005) defines integrated governance as being a part of strategic planning, Enterprise Architecture, workforce planning, capital planning and security,. As such the Coherency Architect can make use of the breakout strategy to articulate a vision for how the AS – IS state of the enterprise architecture should be dealt with and how the transition from the AS – IS state to the TO – BE state can be done. As such the Enterprise Architect and the Coherency Architect should be aware of that the enterprise shouldn’t move from the AS IS situation through a so called big bang change where everything is changed in the same time. The reason for this is that when big bang change occur then it often fails. Therefore big bang change should be considered a risk and as such the enterprise architect and the coherency architect should avoid using the approach. Instead should the focus be on how the enterprise should move gradually to achieve its approach and by such the program for change should accept this focus. When it comes to competitive advantage then the breakout strategy emphasizes that not a single process or single element of the business model can lead to a competitive advantage and as such that is in line with the what Porter (Porter 1998) emphasizes. Likewise is it worth to mention that the enterprise can’t achieve the competitive advantage just by focusing on operational efficiency solely in the manner than the processes should be done more efficiently and neglect innovation. The innovation processes can essentially aide an enterprise with succeeding in a market. When speak of competitive advantage then it is a necessity to understand that a competitive advantage can only be enabled through several processes (activities within the enterprise) and the competitive advantage has to be sustainable before the enterprise will be able to achieve success. The Enterprise Architect and the Coherency Architect can make use of the Breakout Strategy to make use of to communicate to the executives on how to alter the way the enterprises does business. In this way the enterprise can make use of elements of enterprise architecture e.g., the transition plan so the structure of the enterprise moves from being as it is to something in the future. The focus of the breakout strategy can be used as a driver for applying Enterprise Architecture as a method to enlighten, develop and mature the Enterprise Architect. Ross, J.W., Weill, P. & Robertson, D.C., 2006. Enterprise Architecture as Strategy: Creating a Foundation for Business Execution illustrated edition., Harvard Business School Press. Weill, P. & Ross, J., 2009. IT Savvy: What Top Executives Must Know to Go from Pain to Gain, Harvard Business School Press. Porter, M.E., On Competition, Harvard Business Review, Boston, 1998, p.40-42. It’s notable that the executive team covers also the leaders or owner of small enterprises that haven’t a team of executives. Price Leader which means that the prices are the lowest within the industry. Previous The ATOM Framework: An Idea to Develop an Enterprise Architecture Framework! Next Enterprise Architecture Summer Camp: Preparing for Week 31.